I was reminded by a previous post on the “New Existentialists” by Katie Darling entitled Lessons from a Horse about something I had started writing a few years ago. The piece was about lessons that I had learned from trees. I hope you enjoy my reflections about the hairs of the earth! You can’t fall down without some effect on others around you. One sight any wanderer might see walking in the woods is the lesson of the fallen tree. One sees that all life has to fight for space to grow. A tree’s life is influenced by the surrounding trees in a fight for resources of soil, water, and light. A person might believe that in a place populated with so many trees that any one tree is not that significant. However, the fallen tree teaches the wanderer a valuable lesson. When stricken by lightning, old age, root rot, or termites, a tree might lose its balance and fall. Rarely, though, does it go down without having some effect on trees that surround it. The fallen tree may then lean up against a healthy strong tree so that this healthy tree now must bare the burden of supporting the weight of the dead tree. Sometimes, over a period of years, the living tree will grow into or around the fallen. In other cases, the fallen tree will land upon smaller younger trees, and the weight will be too much for the small tree, and it too will be crushed, broken, or snapped. 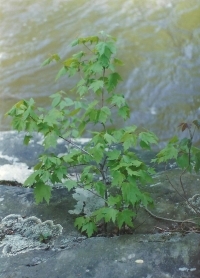 Sometimes, seedlings will grow up through the branches of a fallen tree. The fallen protects the little trees from the forest animals and promotes a different type of growth as the seedlings grow taller much quicker because they have to stretch toward the light. A fallen tree might also act as a bridge across a dangerous divide, or it can be obstacle that appears on a path. Even the decaying tree, softened by the years, provides a home to smaller things and ultimately replenishing the earth as it returns to soil. The wanderer ponders whether people are trees. We are all shot into existence—grow from there. On a large bridge that crosses one of the world’s great rivers, some friends find a spot where the group can climb down onto one of the towering buttresses that support the spanning bridge. This buttress has its final resting location in the river itself, some 80 or so feet down to the river’s surface. The troupe amuses itself by looking straight down this giant manmade stone tower. The buttress is constructed of huge slabs of rock cut approximately in 6 by 10 foot rectangles. At first, one member of the group holds onto the waist of the onlooker as they stare down at the water, but soon everyone is on their belly, heads hanging over the edge, looking down this sheer cliff. The wanderer notices a tree that is growing out of the buttress approximately half way down. In some crack or seam between two of these enormous blocks, a tree has taken root. The shape of the shape reflects its challenges. First, the tree grows out and down, much like the “U” in a sink’s plumbing. The tree then makes an upward turn toward the light. The group speculates on how the tree seed got into such an odd location. One wanderer suggests that the wind blew the seed there. Another wanderer suggests that a bird ate some seeds and evacuated the seed into the crack somehow. This tree certainly did not get to choose where it was born. This environment is hardly ideal—there is no soil! The poor tree is holding on for dear life. Its roots attempting to grow along the cracks; probably, it is trying to create some of cracks of its own in order to make some more room. Certainly, the tree’s location provides little protection for the elements; no other trees surround it to break the wind. There are no other trees on this entire buttress, which speaks to treachery of its environment. Despite all these challenges, the tree has been able to make some adjustments. Initially, it has grown in the direction that it was forced to, as evidenced by the downward turn in its trunk. But at some point, upon gaining some strength, the tree has turned toward that which gives light, towards that which gives life. The tree righted itself. The seriously injured ask us to do more with our health. The wanderer found a tree of significance in the suburbs! How? This paradise was built into a pre-existing forest ,and some effort was originally made to protect the surrounding ash and hickory forests. Most of the front yards were cleared except for the largest trees, but it was not uncommon that backyards were full of trees. The initial owners prided themselves on maintaining the forest. However, just as the second wave of pilgrims had little tolerance for the Native Americans, the second property owners had little reverence for those trees. The significant tree was found in the last forest yard remaining in the neighborhood. The removal of trees by neighbors had a great impact on this lot. The remaining trees were now more exposed natural elements of sun, wind, and rain, not to mention the pesticides and fertilizers the neighbors now used to make the lawns look nice. So, the trees in this yard began to die slowly. Hoping to preserve the last plot, the owner planted a few fast growing evergreens that might provide year-round protection for the remaining hickory and ash. The new trees grew well for a couple of years, until a tremendous summer storm blew through the area and knocked down the one of these pine trees. With its roots sticking perpendicular to the ground, the owner was sure it would be firewood by the following summer. Amazingly, the tree continued to grow. The trunk of the tree lay completely horizontal, yet the tip of the tree had begun to turn toward the sky. Years later, the tree looked like a snake—head up, ready to strike but belly on the ground. The tree reminded the wanderer that humans, too, can be knocked over by the storms. We sometimes do not make it back on our feet. Everything that seemed solidly rooted may now be loose. But as long as there is something in us that is still alive, we will continue to grow. This persistence will make us the most memorable tree of the lot. A slow growing root can split rock. When we walk through the woods, we might notice the patience of nature. In the great north woods, a wanderer saw an amazing tree. The first outstanding feature of this tree was that it had found a crack in a round and smooth boulder. The boulder had a circumference about 20 feet around. This tree had clearly made the crack in this boulder bigger through its own growth. The tree’s roots completely filled up the crack. Thus, the roots formed a wedge that would continue to pry open the rock and would, eventually, split this boulder in half. The second outstanding feature of this tree was that there were also additional roots that could not grow down through the solid rock but had to grow over the outside surface. These roots sought better soil, and they eventually found it in the earth below the boulder. One of these roots must have extended a good 15 feet on the outside surface of the rock before it found the forest floor. How long had this root grown in vain? By the thickness of the root one could tell that it had finally found what it needed. The wanderer wondered: Do we have the patience to slowly change the status quo? Do we know in which direction is the soil that will best serve our growth? Can we stick with our projects that have not hit pay-dirt?